Australia Post is celebrating the 60th anniversary of Her Majesty Queen Elizabeth II’s coronation with the release of one domestic base-rate (60c) stamp and one international-rate ($2.60) stamp. 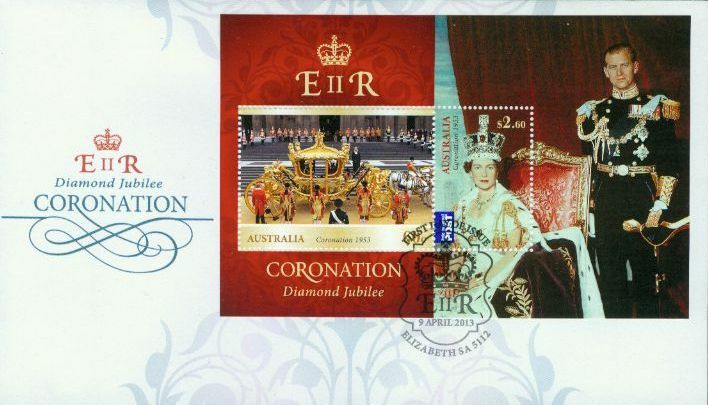 "Australia Post is delighted to recognise the Diamond Jubilee of Her Majesty's coronation with the release of this stamp issue," said Australia Post Philatelic Manager, Michael Zsolt. "We're pleased that this special stamp issue will be a great memento of this wonderful event for collectors and the public." The coronation of Queen Elizabeth II took place on 2nd June 1953 over twelve months after her accession. The Queen rode from Buckingham Palace to Westminster Abbey in the ornate Gold State Coach. During the coronation ceremony, Queen Elizabeth swore the coronation oath, undertaking to rule according to law, to exercise justice with mercy and to maintain the Church of England. She was then anointed, blessed and consecrated and crowned by the archbishop before trumpets sounded, the Abbey bells pealed, and guns at the Tower of London saluted. 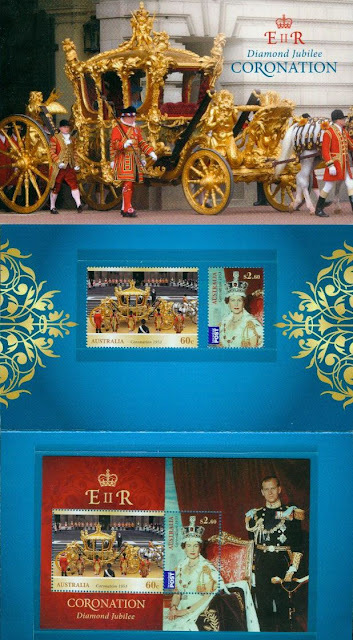 The large-sized 60-cent stamp features the Gold State Coach which has been used for every coronation since that of King George IV in 1821. The photograph is by Tim Graham from Getty Images. The $2.60 stamp features a photographic portrait of the newly-crowned monarch in 1953 and is a detail from a full formal portrait of the Queen and Prince Philip. The photograph was taken in Buckingham Palace by renowned photographer Cecil Beaton and is featured on the miniature sheet. The image comes from the Victoria and Albert Museum in London. A special pack is available which features an embellished sheetlet of 10 x 60c double-definitive stamps housed in an attractive folder. Other associated products include a first day cover, stamp pack, maxicard set of two, sheetlet of five x $2.60 self-adhesive stamps and a stamp and medallion cover. 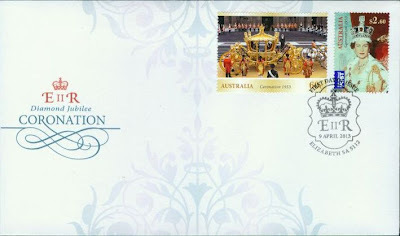 The stamps and associated products were designed by Jo Mure of the Australia Post Design Studio. Jo's previous stamp issues include the Royal Wedding (2011) and the Queen's Diamond Jubilee (2012). 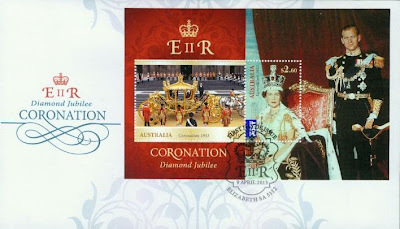 The Diamond Jubilee Coronation stamp issue is available from 9th April 2013 at participating Australia Post retail outlets, via mail order on 1800 331 794 and online at auspost.com.au/stamps while stocks last.